The modern cultivation of vines in Sicily allow, thanks to particularly dry and windy conditions, growers to produce grapes without the addition of any artificial chemical products. They use their climatic advantage and the ancient knowledge gained in the cultivation of vines in these soils. Castellani winery was founded in 1903 and have always practiced sustainable agriculture. They gained Organic Certification in 2003. Beautiful aromas and flavours of rich dark fruit, black cherries, leather and earthy spice. The addition of the Merlot brings velvety, soft tannins to the blend. Great everyday value. 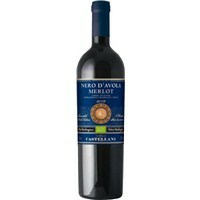 Food Pairing: Perfect companion of Mediterranean cuisine, grilled red meats, rich casseroles, pizza & mature cheeses.